Whenever we attempt break down the key success factors in managing complex B2B sales opportunities, it soon becomes apparent that there are a number of critical activities that need to be mastered between the first contact with a potential customer and the conclusion of a successful sale. And when we go on to compare the differences between our top sales people and their less-effective colleagues, it is usually equally obvious that the competence and skill with which they perform these critical activities has a profound impact on their outcomes. Over many years, and following dozens of sales effectiveness assignments, I’ve identified 14 critical factors that seem to have a consistently important impact on sales success. I wonder how my experiences compare with yours? Now, 14 factors might seem like a lot to master - and it probably would be for simple low-value transactional sales. 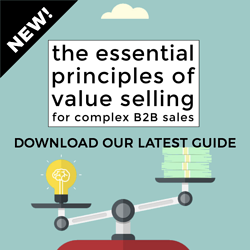 But don’t forget that these observations are in the context of complex, lengthy, high-value B2B sales. With that in mind, let’s also acknowledge that the amount of resource - not just the sales person’s time - required to win these complex deals is substantial, as are the rewards of winning and the costs of losing. Mistakes tend to be expensive! These complex B2B deals suffer from multiple potential points of failure, and they rarely give sales people the opportunity to pull off one of those mythical heroic last-gasp manoeuvres that transforms a failing deal into a success. The foundations of failure are often too deep and have usually been laid much earlier. Consistently successful sales people (and their managers) have learned that making the right choices and doing the right things from the very start of the sales cycle is a much more reliable and ultimately far less nerve-wracking way of winning. Effective prospective involves targeting the right issues (the ones you are best positioned to solve) and engaging the right contacts within the right organisations (the ones you have the best chance of doing business with) at the right time (when the prospect is motivated to act). Are you confident that all your sales people are currently doing an equally competent job of this? It is said that we never get a second opportunity to make good first impression, and that is certainly true in the opening remarks of any sales interaction. What we say in these first few moments influences what happens throughout the rest of the sale. Are all your sales people currently saying the right things during these pivotal moments? Whether we’re responding to an inbound enquiry or reaching out to a potential target, we need to judge whether our initial prime contact has the potential to be a mobiliser and change agent sooner rather than later. Top sales performers have learned to assess this early. Their weaker colleagues often behave as if they are grateful to be talking to anyone. Where do your sales people sit along this scale? The discovery process is another pivotal period in the sale. Top sales people have learned to resist the temptation to pitch their solution until they have fully understood the prospect’s situation, challenges and implications. Less effective sales people tend to turn the conversation towards their solution the moment the prospect acknowledges a need (and sometimes without even waiting for this stimulus). How many of your sales people are suffering from a hair trigger? It’s important that we start to qualify the opportunity from an early stage - but that we also recognise that we may not be able to find out everything we need to know until we have progressed our dialogue with the customer. Is the prospect’s key problem clear, and is it one we are really good at solving? Does our prospect have a compelling business reason to act? Is the organisation the sort of company we can do successful business with? Is our prime contact a proven mobiliser and change agent (see #3)? Is it obvious how the project is going to be funded? Urgency: Is there a clear reason why this project needs to happen now, rather than later? At first, our potential opportunity might not have perfect scores against all of these: but an honest assessment of these factors will allow us to judge whether we might need to proceed with caution. Have we fully engaged the decision group, are where do we stand with them (see #7)? Do we understand our customer’s detailed functional requirements, and can we satisfy them? Do we understand the prospect’s decision criteria (formal and informal), and are they favourable to us? Do we understand the prospect’s decision process and timeframe, and is it realistic? Have we identified all the prospect’s alternative options, and where do we stand against them? Do we understand the relative priority of this project compared to all their other current investment options? If we’ve still got blind spots in any of these areas at a late stage in the sales cycle, these need to be recognised as key risk factors. Top sales people realise the importance of identify and engaging as many members of the customer’s decision-making group as possible but place particular emphasis on working with and through powerful sponsors who are also proven mobilisers and change agents. Less effective sales people often find themselves overly dependent on a single point of contact who ultimately proves unable to drive their organisation’s change agenda. How many of your sales team’s current opportunities are single-threaded through one insufficiently influential individual? I’ve written before about the downsides - in complex sales environments - of delivering a premature “product demonstration”. Before we go into the detail of our solution, it’s often best to lay the foundation by explaining our high-level approach to solving their problem and why we’ve chosen to do what we do. Top sales people use conceptual sales strategies to trigger memorable “ah-ah!” moments that persist throughout the rest of the sale. How often are your average sales people able to create these “ah-ah!” moments? Once we have laid the conceptual foundation, we can then explain how our proposed solution meets their detailed functional requirements - but rather than doing a generic and often confusingly wide-ranging “product” demonstration, we can focus our attention on the handful of memorable capabilities that are particularly connected with the prospect’s most important criteria and priorities. How many of your sales people are selling a customised solution rather than a generic product? 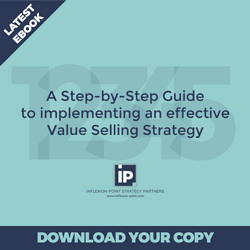 Most significant purchase decisions require some form of business case, and yet the majority of sales proposals lack a compelling financial justification. Top sales performers have learned that this isn’t just about building a Return on Investment (ROI) projection - it’s also about showing the customer the impact of inaction that would result from a decision to stick with the status quo. How many of your sales people are able to consistently articulate this sort of value? 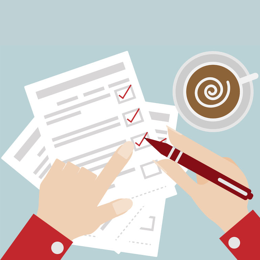 Submitting a proposal is often regarded as a pivotal moment in a sales campaign. But in truth, what happens before and after the formal submission is far more important. We must always ensure that the proposal reflects a series of already tested agreements. We need to ensure that the executive summary sells the need for change just as strongly as it sells the benefits of our solution. And we should always arrange a post-proposal review meeting before we submit our document. How often is this happening in your current sales proposals? Most high-value contracts go through some form of negotiation - and it is often detailed and intensive. But the foundations need to be laid far earlier by establishing our unique solution value (see #9 and #10) in ways any other competitor would find hard to replicate. And then when they are engaged in the negotiation, top sales people can be confident of their value and know where their give/get boundaries are. Less confident sales people often imagine they can discount their way to a sale. Even after we’ve negotiated a win-win agreement and have been told that we have been selected and that our sponsor would like to proceed, they will often have to navigate a formal approval process, in which the project will be competing for attention and funding against a range of often completely different potential investment priorities. Unfortunately, many apparently promising projects get derailed or delayed at this late stage. Recognising this, top performers collaborate with the project sponsor to put together the strongest possible project justification. Weaker sales people often just trust in the process and stand aside and wait for the outcome. So, there you have it - 14 critical sales activities. Miss any one of these - or fail to perform them to the required standard, and the opportunity may be put at risk. Ignore any significant number of them, and your sales people’s chances of success will plummet. You might be in an environment that excludes a few of these factors. You might be in an environment where other critical activities have proven to be consistently important. But whatever your circumstances, it’s a fair bet that your top sales performers - whether consciously or unconsciously - are covering off these critical activities. And it’s a similarly fair bet that your weaker sales people will be ignoring some of these critical activities or performing them in a half-assed fashion. But if they are unaware of these factors or have not been properly trained, guided and coached in their application, it’s an equally fair bet that your organisation will be missing forecasts and revenue targets as a consequence. If any of these ideas resonate with you - if you’d like to improve your sales organisation’s competences in any of these areas - please drop me a line or (even better) book a call and I’d be happy to share my experiences of helping organisations like yours deal with them. 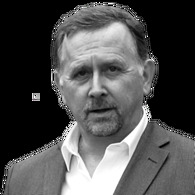 Bob Apollo is a Fellow of the Association of Professional Sales, a regular contributor to the International Journal of Sales Transformation and the founder of UK-based Inflexion-Point Strategy Partners. Following a successful career spanning start-ups, scale-ups and corporates, Bob now works with high-potential tech-based B2B-focused scale-up businesses, equipping them to Sell in the Breakthrough Zone® by systematically creating, capturing and confirming their distinctive value in every customer interaction.